I think ‘muffin-top’ is the official phrase. The way my stomach wibbles, wobbles and squeezes into trousers since being pregnant and having lovely Anabelle. Despite being lighter in weight than I was before I was pregnant, my body shape has changed drastically. This is still taking some getting used to. I feel bigger than I ever have before; mainly because of the fleshy Mummy tummy that has been left behind. Now I must be honest, I’ve done nothing to even attempt to make the muffin top go away, so really I shouldn’t complain about it. In the 8 months since Anabelle died I don’t think I’ve exercised once, unless you count ice-skating at my nearly sister-in-laws hen day. I know sit ups and hard work are required to tone back up but I’ve zero motivation to do anything at all. So my body image isn’t great. Would the muffin top have bothered me if Anabelle was here? I think it would’ve been a much lesser extent. I would’ve had far more pressing priorities than to worry about what I looked like. I would’ve been busy being a Mummy. I have a post-baby body without my baby. The scars of pregnancy are left behind. I realise there is the highest likelihood that my stomach will never return to what is was; it grew a baby, I’ve got a mother’s body now. I look at photos of me from this time last year, and I look young, fresh and sparkling. I don’t think the same is true today. My eyes look older, I look aged. There are more lines, darker bags; probably from all of the tears. Next Monday I turn 26. Jon turns 30 on Sunday. I think both of us feel and look far older than our years, we behave it too, our life experience has made us this way. Since our last birthdays we’ve had to grow up fast; there has been no time for immature games and light-hearted fun. We’ve had our daughter to bury, her grave to visit, her headstone to order, our horror to survive. Old before our time? Definitely. Just this week alone we’ve received £15 giftcard from Peacocks, a meal for two at the Toby Carvery, a meal for two at the Parkway Hotel, 2 tickets for 2 hours of laser tag games at Taskforce, a family ticket into Techniquest and a whole load of bags, clothes and hats from Animal! Add this to the afternoon tea for two at the Hilton, Sunday lunch for four at the Holiday Inn and dinner, bed and breakfast for two at the Cwrt Bleddyn Hotel that we had previously received and we’re well away already with raffle prizes. Additionally this week, Glitterbugs (a children’s hair and party salon) has been in contact and want to join the day by providing facepainting and sparkly tattoos for children! When we first started planning Anabelle’s Angel Day I’m not sure what sort of response I expected. But I’m truly amazed and ever so grateful for all that is being donated our way to support our fundraising and make Anabelle’s day truly memorable and successful. Today, Sands have released a statement regarding their work with stillbirths worldwide. Reading the worldwide figures made me sick to my stomach and has made me more determined than ever that my little bit of fundraising make even the smallest of difference to the awareness and funds that need to be raised. Each day in the UK alone 17 babies die as a result of stillbirth or neonatal death. Shockingly worldwide figures, for each day reach 8700 babies. It is estimated that each year, across our world 3.2million babies are stillborn. I despair that 3.2million babies are dying every year across the globe but that stillbirth continues to be a silent issue. I despair that in 2010 my own daughter was just one of these babies in this astronomical statistic. Do these lives not matter? Why is there next to no awareness? Why is there shoddy reporting after a celebrities loss? Many of these babies die unnecessarily so what makes other research more of a priority than this one? Please do not be fooled into thinking that this is mainly a horrible thing that happens in the third world. Remember that 6500 of those deaths are right here in the UK every year. 3.2million includes babies across America, Europe, Austrailia and the rest of the developed world with our outstanding and available medical care. This is worldwide, developed and underdeveloped alike. And so I implore you to pledge your support to Sands, remember Anabelle and all angel babies and make people take notice. Ah facebook. We have a bit of a love-hate relationship going on. In the very early days it was the source of a lot of my hurting; the photos, the negative status updates about offspring, but a lot of that has faded now. I accept the family photos and pay no attention to negative status updates. All I have now is level of distaste for facebook full stop but can’t seem to keep myself away. Because even though I don’t think it does me a lot of good for the most part it does keep me connected to people, and I have plenty of support there too. On facebook there is Ally, who has spoken to me nearly every day without fail since I returned to my page after Anabelle’s death. She seems to know exactly what to say and is never dismissive or uncomfortable with anything I say. Ally doesn’t give me platitudes, she listens and gives a considered response, not just what she thinks she is supposed to say or what I want to hear. Ally has been one of my biggest virtual and real life ears and I wouldn’t have had that without facebook. There are also many people send me kind messages through my facebook account that I wouldn’t receive otherwise and these messages are encouraging. Only this weekend three different people have taken the time to send words of hope, encouragement and understanding through my inbox. So for all the hurt facebook has caused over the last 8 months it has also been an avenue of constant support from others. When I started blogging I was initially nervous of publishing my posts to my facebook wall. I’m acutely aware that in this blogspot; my space, I am hard hittingly honest about my life and hurt and grief now. I am aware that this probably makes for difficult reading and probably makes some uncomfortable if it challenges them to confront their own actions and attitudes around grief, or me. Maybe it pricks peoples conscience. But you know what, I’m also aware that for so many bereaved mothers, we are expected to conduct ourselves in a way that puts other people at ease, it is the expectation that our own upset and anxieties will be put aside and we will not makes others uncomfortable with our grief. And so we’re expected to be fine and ‘behave’. The courtesy of putting us, the grieving mother, at ease is rarely extended. Unintentionally as it may be, it is as if the general opinion is “it our problem to deal with”. I know people, for the most part, are unintentional with their insensitivity and thoughtlessness but that doesn’t mean it shouldn’t be challenged or brought to attention. For too long the bereaved mother has been voiceless. Expected to move on from her despair and get on with life without there being too much acknowledgment or mention of her child’s existence. I’m not going to be that mother. This blog is my voice, my outlet for letting go of bit of my grief and hurt at a time. I will never apologise if my hurt makes somebody else uncomfortable, because I would challenge them to try and see the bigger picture. It is one of my greatest hopes that my stark openness helps others to relate to bereaved mothers, raise awareness to turn thoughtlessness into thoughtfulness. And so I publish my blog to facebook and twitter hoping for most the insight into a bereaved mother’s life is insightful and educational. Creating links rather than barriers. Because above all, a little bit of thoughtful courtesy and a little bit of understanding goes a long way in my world now. Babies are everywhere; every time I leave this house there is almost 100% guarantee I will be confronted by the sound or sight of a tiny infant. Even this weekend, at the evening celebrations of my nearly sister-in-laws hen night there was a baby. For the most part now I deal with babies pretty well I think. I’ve learnt to expect babies in the supermarkets and out and about and so feel less phased by them, I feel more able to go into my neighbours houses with their babies who were born days either side of Anabelle, I do ok with the babies at church. I do ok because I expect them to be at these places, a sort of knowing what I’m letting myself in for and being prepared for it. But Saturday night I didn’t do very well. Not as bad as the early days when there would’ve been a complete meltdown, but not brilliantly all the same. You see it hadn’t occurred to me at all that I had to steel myself for the sounds and sights of a baby that night and as such I was left unprepared. After all hen nights are not the usual places for finding babies. In many respects I probably came across as rude, I didn’t make that much of an effort with others for the meal, but inside I was desperately trying not to cry. Baby cries and noises leave me feeling anxious, a painful reminder of something we never had. We never heard Anabelle make a single sound. I know I have to get better still with dealing with the unexpected but small babies and heavily pregnant women just serve to remind me of where I failed and how our lives are left empty while other people’s families fill up some more. The first time I saw another baby after Anabelle death was at my cousins wedding. It had been 5 weeks, I’d barely physically recovered from giving birth let alone started to deal with my emotional wreckage. I knew there was going to be a tiny newborn girl there but for some reason I felt I needed to be at his wedding regardless. In hindsight attending was a really stupid thing to do. The fact that I was barely holding it together most days as it was should’ve been reason enough not to go and make my life even more unbearable. So the barely holding it together turned into unravelling fast before the ceremony was even over. Watching another baby girl be cooed over while my own was still fresh in the ground; I hated everyone that day. But I guess I thought if I missed my cousins wedding, I missed it forever. It was once in a lifetime and I thought I needed to go. So my brother’s wedding draws continually closer. In just under 5 weeks I will be at another wedding. There is much to prepare myself for – 25 invited babies and small toddlers on mass. I’m hugely anxious about it and how I will cope. Surrounded by families when all we want is our own. I continue to struggle with the unfairness of it all. The only small child that should matter that day is not there at all. Today marks 8 months since Anabelle was born. 8 months into the rest of our lifetime of being a broken family in the worst possible way. Today my arms ache to hold her. My diary has always been my right arm (or left in my case, being as I’m left handed) in work and indeed life; but none more so since my return from maternity leave. Without my diary these days I cease to function. I find myself becoming increasingly reliant on lists and writing everything, and I mean everything down. If I don’t you can guarantee I’m going to forget what it is I have to do and what the deadline is. Gone are my highlight days of organisation, planning and control. The last couple of weeks my diary pages are becoming fuller and fuller; more and more colourful and decorated as I use a variety of different pens, circling items and underlining in an attempt to make them stand out and help to remember. It really does resemble my state of mind and the inability to concentrate on lots of things these days. Only last week, when we were doing our food shop I found myself stood in the fruit and veg section and for about 30 seconds drawing a complete blank. I even had a list infront of me but it was almost like I had forgotten how to read or navigate my way around to find the items. A fuzzy head that refuses to think. It really is most disconcerting. No wonder I feel a little like a crazy person. At the bottom of my weekly diary there is always a quote. Usually I don’t take much notice, infact I hardly ever read them. But today I noticed what this week’s quote had to say – it seemed fitting. Yes for much of the time I feel completely defeated, in every aspect of my life, but I haven’t given up. Throughout the pain of missing my daughter I still take on life. Rebuilding continues to go on and even if there is a long way to go; I get up, I function for the most part, I go to work, I do normal everyday things. I could be so much worse and I need to keep reminding myself of that on the bad days and congratulate myself on the good. Although my life resembles something so extraordinary I still take on the ordinary. That quote made me feel positive; the defeat that threatens so much of our lives will only be temporary because we haven’t given up. Thank you Marylin vos Savant. Yesterday was a terrible day in the Morgan household. It is extremely rare for me and Jon to fall out on a massive scale; infact I can count on a couple of fingers the number of serious fights we’ve had. But yesterday was one of those times. We screamed and shouted at each other, both said nasty things. The detail of our fight doesn’t matter; details always look silly when you think back. But when the fighting stopped we cried and cried. We cried for our daughter and the pain that surrounds everything in our lives now. The good that came out of this row is that we opened up. You see me and Jon grieve very differently. My life revolves around all things Anabelle. I’ve immersed myself in planning her special angel day, I think about her nearly every minute of every day, I blog about my life now. I need to feel like I’m doing something for her, to feel like a Mummy. That is not to say Jon doesn’t think about Anabelle all of the time too; but he copes by distancing himself from the raw pain. Jon has immersed himself in photography, he likes to be distracted, he doesn’t like to talk, not even to me. His devastation is covered by a very strong exterior. For the most part we’ve accepted that we cope differently. But every now and again Jon’s strong exterior fools even me. Sometimes it makes me feel insecure about my lack of coping, a little bit more like a crazy person, but in reality we’re as bad as each other underneath it all. Yesterday after this horrendous fight, Jon opened up properly for one of the first times since the early days after Anabelle’s death. Both of us were feeling pretty rough overnight and not completely ourselves today. Yesterday was the third proper row in our five years together that I can remember. Of course we regularly bicker like all normal couples, but rarely are we angry with each other. As corny as it is, Jon is my soul mate and I love him unconditionally. You may remember from my post called “Seven” how Jon and I met. Not conventional by any means, but probably more common than people think in this modern internet connected world. Before facebook we were both on a site called faceparty – a poor version of facebook by todays social networking standards! Now I used to get loads of horrible sleazy messages on faceparty, I ignored every one of them. Then this one day Jon sent me a message; not at all sleazy or horrible. Infact just very normal; saying simply “Hey, we went to the same secondary school.” I decided to reply. Then my 21st birthday arrived. Jon insisted that he was going to take me out for a drink. So I tentatively agreed. We finally met. A drink turned into an entire evening spent together chatting and laughing – our online friendship transpiring into real life. We already knew each other so well, within weeks we were inseparable and the rest, as they say, is history. I have known Jon now for 6 years; we’ve been together for very nearly 5, engaged nearly 4 years ago, married for 18 months and parents to our angel daughter for 8.
Who could’ve predicted our relationship from that first message about school?! I don't think I would've believed it if someone had told me then! It is an understatement to say that life has been cruel to Jon and I recently, but tragedy and devastation makes or breaks a relationship; with our already firm foundations it has made ours. Nothing and no-one could come between us. Today on Valentine’s Day I want him to know how much I love him. To celebrate how we slowly fell in love through a series of messages, quickly fell in love after we finally met in person and how I continue to fall in love with him daily. There is no other person in this world who I would want to spend my life with. For better, for worse, in sickness and in health; I love you. Wishing everyone a happy Valentine’s Day. I refer once again to the Wish List; a plea for understanding and not judgement for all who grieve. A realisation for all that there is no right or wrong way to remember or act. A realisation that it is unacceptable to make judgments and flippant comments or opinions about something you have zero experience of; and even more so if you do. Once again I reiterate that there is no such thing as normal when it comes to grief. As far as I’m concerned or anyone else should be; anything that brings even the smallest of comfort is completely ok. It is the rituals of remembrance and honouring of memory that helps to survive the horror. I wish you wouldn't judge us because we are not acting the way you think we should be. The truth is grief is a very personal thing and we are all different people who deal with things differently. It has been a weird week. Thursday we had our conclusion appointment regarding Belle’s death and all the tests that have been done on me since. These last test results were just to confirm everything we already knew; no reason can be found for my daughter dying. She had no chromosomal abnormalities, I have no blood disorders. Our little girl was perfect yet she didn’t make it. Granted only a short little life. I still cannot shift the feelings of guilt and failure, I feel like I massively let her down. I knew this appointment was going to confirm no reason, as I’ve said before we’re not sure we even want a reason – it changes nothing, but WHY is a pretty big question that will forever be unanswered. We’ll learn to live with that though; what choice do we have? The last few days I’ve been playing the day before her death through my head again. All the what ifs, all the things I could’ve done differently. I could’ve made more of a fuss at my midwife appointment that she had started to go quiet. It had been about 3 hours at this point since I’d last felt her move – but the midwife had found her heartbeat so I thought 3 hours wasn’t long enough to start getting hysterical. I could’ve asked the midwife to send me into hospital for another check-up when she commented that Anabelle’s heartbeat was slightly faster than it should be. A normal baby range is 110-160 in the womb, Anabelle’s at this last appointment was 170. The midwife commented, but said it wasn’t enough to be unduly concerned. 12 hours or so later Anabelle was dead. I could’ve gone to the hospital Tuesday night instead of waiting until it was too late on the Wednesday morning. Anabelle had continued to be quiet all day. But the midwife had found a heartbeat, and we had found a heartbeat on our machine before going to bed. She was there; so I put it down to her having a quiet day, sleeping, running out of room to be moving around too much – because that is what the baby book says. We agreed that if she still wasn’t being very active in the morning we’d go in. The morning came, the heart monitor went back on and we heard nothing. Our nightmare began. I should never have waited for the morning. I could’ve spent the whole night in bed, surrounded by my pillows supporting her. Instead that night I ended up on the sofa because Jon’s snoring was keeping me awake. It is ridiculous, but this week it is this that I’ve been beating myself up about the most. In the light of a confirmation of unexplainable death, did I somehow squash her or suffocate her because I wasn’t supporting her properly on the sofa? Anabelle’s death feels like my fault. I somehow feels like I killed her. Rationally I know this isn’t true, but I had one job to do – get her here safely and I couldn’t do it. It leaves me doubting my ability to look after any baby through pregnancy. My judgements for Anabelle were so wrong that day. What if I make wrong judgments and let another one of my beautiful children down? I’m not sure I trust myself to read the signs. The appointment this week has put us in an uncomfortable place. I spent most of Thursday sighing; not sure how to be. Almost 8 months since Anabelle was born and it all amounted to a short consultant’s appointment telling us nothing. It seemed final. Nothing medically anyone can do or say for her anymore. They don’t want to see me now until we’re pregnant again. This morning her headstone draft has arrived through the front door. We need to sign to confirm all the details and give the go ahead to proceed. Today another angel Mummy joined British Mummy Bloggers. Her son was born sleeping, like Anabelle, and she also blogs about her experience and life after her little boy’s death. She calls it finding her new normal. http://findmynewnormal.blogspot.com/ Of course, normal for both of us now is something unknown; something foreign and different. I’m still not sure what my new normal is. Normal one week doesn’t equal normal the next anymore. When I’m feeling particularly low there is no way of telling what will be normal from one day to the next. After reading this Mums blog today and a post on how she feels different now I’ve spent time reflecting again how Anabelle’s death has changed nearly every aspect of my life. Some negative changes, others positive. I’m now a ‘glass half empty’ type of person. I was always a bit of a worrier, but now negativity surrounds me. I fully expect something disappointing, upsetting, devastating to happen to us. I didn’t always feel this way; 12 months ago we were pregnant and nothing in the world could’ve been better for us. I only expected good things for our future. Now we have an angel baby and lumber puncture results on the way that have the potential to shatter our lives just that little bit more. Of course, the results could bring good news; I just expect them to say the worst. Anxiety fills my life now, try as I might to cling onto some hope and faith. I cannot concentrate. Yesterday I was in the supermarket with Jon, with a list in front of me and still couldn’t figure it out. I feel like a crazy person a lot of the time. It is like my head refuses to work properly, like I’ve forgotten how to think so my brain is often one big mush of fuzziness. The simplest of tasks sometimes can feel enormous. I’m forever forgetting things. I used to love reading, I don’t think I’ve read a book since Anabelle died – I just cannot concentrate on it. My friend lent me the first two books in the Twighlight series about a month after Belle was born, I managed about chapter and a half and had to put it down because I couldn’t for the life of me remember what I’d just read. I still can’t. If anything the concentrating problem seems to be getting worse as time goes on. I’m angry. So angry. I know anger is not a good look but I have no time for nonsense anymore. Sometimes the anger is because of sadness, other times resentment, other time jealousy. Sometimes the anger will be directed at the media; papers, TV, sometimes facebook or other website, sometimes my family. In fact my poor family, my Mum, Jon get the brunt of it, the brunt of the days where I stop coping with my world. Because you see, my world hurts, my world is unjust and my world is broken. I’m no longer a people pleaser. Although I suppose that would depend on your opinion as to if you agree this is positive. Once upon a time I would’ve bent over backwards to make sure other people were happy. I would’ve avoided confrontation at any cost. I still don’t like confrontation, but I won’t avoid it at any cost; like I said, these days I’ve no time for nonsense. I’m not as inclined to put myself out for people. I used to be a “chaser” trying to keep up and in touch with everybody– now I’m not the “chaser” some people have drifted away. It is a real truth that tragedy highlights who is really by your side and who you can rely on. These are the people I will put myself out for in future. Jon and I are very together. I knew we were strong before, but there is nothing like life experience to prove it. We have been through more in our early marriage than most people go through in a lifetime; his serious condition on our return from honeymoon, our daughter’s death and whatever these lumber results are going to find. Tragedy makes or breaks a relationship and I know it has made ours. Nothing could possibly break us now. Besides Jon is the single person in this world who truly understands my pain; how on earth would I survive the rest of my life without Anabelle if I didn’t have him? As 1 Corinthians 13 v 7-8 says “Love bears all things, believes all things, hopes all things, endures all things. Love never fails” I know without any reservation that I and Jon have true love and that our marriage is forever. I truly know where my priorities are. My family above all else. I know what it is like to feel a mother’s love now. There really is no love like the love you have for your child is there. I can’t describe it. Anabelle is not even here but my heart bursts with love and pride for her. I worry that I love Anabelle so much that I will run out of love for our next child. Although I know that could not be true; our next child will bring their own unique joys to our family. Anabelle has taught me how treasured each of our children will be, how we will appreciate what a gift it really is to be have a child, not something to be taken for granted but something so precious I will dedicate everything I can and have to Anabelle and any other baby that will come along. There is nothing in this world that would stop me rightly putting my children first above all else. I wish you understood that losing my baby has changed me. The truth is I am not the same person I was before and will never be that person again. If you keep waiting for me to get back to "normal" you will stay frustrated. I am a new person with new thoughts, dreams, beliefs, and values. Please try to get to know the new real me-maybe you'll still like me. This week the Chinese nation are celebrating their New Year. Another new year. This year, in the Chinese zodiac, is the Year of the Rabbit. Last year, the year Anabelle was born, was the Year of the Tiger. I’ve been thinking about personality. The other day there was a post about Chinese New Year, the year you were born and if it accurately reflected you. I don’t actually believe in these things, but I do find it interesting and a bit of fun. My personality, I think anyway, has changed a lot in the last 7 months. I’ve lost myself. I used to sparkle, I’m not sure that is true now. I was born in the Year of the Ox in 1985. In particular the Wood Ox. "Wood Oxen work well as part of a team, but because of their work ethic, self-confidence and strong sense of morals, they’ll always perform better as the team’s leader. They do have a tendency to be quick-tempered and outspoken." Now I tend to think this is fairly accurate. Apart from the self-confidence, that is completely shot to bits. I doubt myself often now, lost all belief in myself when I failed to bring Anabelle into this world safely. Jon was born in the Year of the Rooster in 1981. In particular the Metal Rooster . Now I don’t really see Jon in that at all. Jon has a tendency to be ‘always be right’ I suppose but definitely not egotistical and he isn’t at all aggressive, well apart from behind the wheel of a car! Jon is far more laid back than me. Anabelle was born in the Year of the Tiger in 2010. In particular the Metal Tiger. We will never know how accurate a description of Belle’s personality this would’ve been. But I like that she shares the same element as her Daddy. Both of them metals, all of us apparently strong characters. I wish we had been given the chance to get to know who she really would've been and miss her desperately, all the time. Two weeks ago one of the pupils in my class died. A beautiful girl with a beautiful smile and infectious giggle; she lost her battle with a degenerative syndrome she had lived with since birth and left this world peacefully in her sleep. She was 8 years old. Unfortunately, working with children with profound and complex difficulties comes with life-limiting conditions and the worst ‘part of the job’. Today was her funeral. To be honest until today it hadn’t really hit me. She was so often absent from school with poor health that I hadn’t felt a ‘change’ until today. This afternoon after the funeral it felt ‘changed’ – a pupil missing. I’d been feeling nervous about it, the first funeral to attend since my daughters was another little girls. I didn’t have to go but I wanted to, professionally it felt wrong to even consider not going; I’d taught this little girl for almost 4 years. It was always going to be hard. Any funeral is hard, but none more so than a child’s. I was doing ok and then the coffin arrived. It was pink. Pink like Anabelle’s. It had crossed my mind the day she died it might be. But then I hadn’t thought about it since and as such I was left unprepared. And standing there, seeing another pink coffin I was transported back to our own. I gasped, shaking on the inside. All I could see was Anabelle sleeping inside her own coffin again and Jon carrying her into the church. The afternoon before her funeral we’d gone to spend time with her in the chapel of rest. I’d gasped then too; seeing my beautiful girl in a coffin, the reality that our baby was indeed dead and how tiny it and Belle was hitting home once again. That afternoon we placed in her coffin the first toy we’d bought her, the tiny teddy bear the hospital had given us for her, a photograph of me and her Daddy holding her and a letter we’d written to her. I remember checking the lid on the side; that her name had been engraved and spelt properly. And then we sat, sat with her, held her hand, kissed her and cried. Our eyes glued to her, the last time we were going to see our daughter before she was buried. While we were there I read Belle her first, and last, bedtime story; one of my favourite stories. It is a lovely story about how much Little Nutbrown Hare and Big Nutbrown Hare love eachother; the love between a parent and a child. 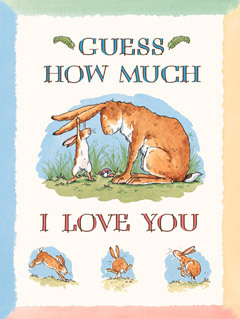 Throughout the story they attempt to measure up their love in comparison to other things, until Little Nutbrown Hare gets sleepy. It ends with Big Nutbrown Hare putting him to bed, kissing him goodnight and telling Little Nutbrown Hare that he loves him right up to the moon and back. Every year I have read this story around Valentine’s Day with my class. This year I’m not going to be able too. This story belongs to Anabelle now. So special is the ending to us and her that “To the moon and back” is part of the engraving we’re having on her headstone. Linking to that precious first and last story time we were able to share. Today has been difficult and painful. I thank God for good friends, especially for Sorreya, who today has looked after me, held me, understood and got me through. Today there have been lots of tears; for Anabelle, for my 8 year old pupil and for the shock and hurt of it all.